Can be presented up to 300 students at a time, please get in touch to discuss requirements if you have a larger group. Can be from 45 minutes to an hour long. Mo can offer a whole school assembly which can be from 45 minutes to an hour long and is very interactive. Mo reads a bit from the ‘My Big Fat Zombie Goldfish’ books and talk about the process of taking a book from idea to actual published copy. Mo follows this up with a bit of stand up about the incident in her childhood that inspired the book, which leads into a mass brainstorming session about idea sparking for books. The children get to share ideas, dress up as characters from the books and it all ends in a Zombie Fish Face Off. Lots of evil scientist Mwhaaa haaa haaa laughing all around but also some great story sparking and some insight into the way a book is written. Mo can do a picture book storytelling session for Reception and nursery children. This works for with her picture book ‘More People To Love Me’ book which talks about how families come in all shapes and sizes. Mo also offers a 30 minute session for Reception, Y1 and Y2 with her latest picture book, ‘Romeosaurus and Juliet Rex’ which includes songs (with a ukulele), dino dancing as well as feathered Shakespearian hats on dinosaurs. A bit of culture and a lot of fun. Maximum 40 students per workshop. Best suited to a classroom environment. Mo can run a creative workshop in year groups or in class groups for Years 3 -6. In this creative writing session pupils make a story map that starts with creating a strong central character and spins a story out from there. They will work on methods for creating a story and then map out that story taking in the key points of Character, Plot and Setting. By the end of the session pupils will have a story map with sections of their story written and planned. There is plenty of opportunity for verbal input as well as drawing and writing. Mo’s’Drama in Writing workshop’ explores the connections between acting, directing and writing. This workshop is very much an on your feet experience that combines Mo’s experience of acting and writing. Children will not pick up a piece of paper in this workshop. Instead they would explore the creation of character and emotions on the page by acting and demonstrating those emotions. One of the most common notes given to new writers is, ‘Show, don’t tell.’ This is also one of the most common notes given by directors to new actors. Mo and the students explore, through drama exercises, how to show emotion through action and how to convey intent through dialogue. They also touch on the concept of muscular memory, which is a technique that actors use to recreate certain moments again and again on stage. Mo will show how this is useful in plotting and planning the actions of your characters, when you are, in effect, directing them in a scene. Lastly, they look at the concept of ‘hot-seating’ their characters to get to know them as an actor would when they approach a role. This is incredibly useful in making characters seem three dimensional in your book. This little girl’s family is huge! The only way to show how huge would be to draw a family tree. With a step-mum, a step-dad, four brothers and sisters, and a whole lot of grandparents, her family tree has a lot of branches – and a lot of people to love her. Mo O’Hara’s warm and playful story will speak to any young child with an extended family. Accompanied by Ada Grey’s charming illustrations, More People To Love Me is a gorgeous book which shows that families come in all shapes and sizes. Two dinosaurs whose species are sworn enemies want to become friends in New York Times bestselling author Mo O’Hara’s prehistoric spin on Shakespeare. In this hilarious take on Shakespeare for children 4 to 8—with dinosaurs instead of people—Romeosaurus and Juliet Rex get along perfectly well until they realize that their families should be mortal enemies! “Your family would eat mine,” says Romeosaurus, who comes from a family of herbivores. Yes, it’s true—Juliet Rex’s family are carnivores, and Romeosaurus’s family are plant-loving herbivores. With two families up in arms (very short ones for Juliet Rex) the two friends run away, determined not to let family baggage determine who their friends should be. With this funny take on the world’s most cherished love story, Mo O’Hara transforms Shakespeare into a relatable and truly funny dinosaur romp for young readers. Coupled to perfection with Andrew Joyner’s expressive and classic illustrations, this tale will get giggles while introducing the most beloved writer known to the world today. Shakespeare’s classic tragedy gets a comic retelling and a happy ending. “Once upon a time, one hundred and fifty million years ago….” Romeosaurus’ family (a mix of dino species) are herbivores, while Juliet Rex’s (T. Rexes and a pterodactyl nurse) delight in eating meat. The two meet at a masked ball, quickly becoming friends, though the herbivores must make a quick escape after Romeo helps Auntie Gladys off the buffet table, where she’s been trussed, with an apple in her mouth, and Mercutio-tops accidentally pokes Tybalt Rex with his horns. The balcony scene leads to a cementing of Romeo and Juliet’s friendship, and the two leave notes for their loved ones and run off to the tar pits. Knowing what danger that poses, Nurse-a-Dactyl and Mercutio-tops fly to the rescue (“We should have let them be friends!”), and the foursome agree that carnivores and herbivores can be friends (not meals). But this happily-ever-after is marred by a looming final-page meteorite. Indeed, O’Hara sprinkles humorous references throughout that will fly over kids’ heads, though parents will be in stitches: “Juliet Rex was waving her tiny arms in the air like she just didn’t care….” Joyner’s digital illustrations are a hoot. The dinos are dressed in Elizabethan finery (dino color and clothing color separating carnivores and herbivores, in addition to the former’s pointy teeth), and their expressions are sure to evince giggles, most being over-the-top. My Big Fat Zombie Goldfish Fiction Series for 7-11 Year Olds. The ‘My Big Fat Zombie Goldfish’ Series has been translated into 11 languages so far and has sold over a million copies worldwide. It also made the New York Times Bestseller List! Then, Frankie takes centre stage to rescue Tom’s school play from Mark’s evil plans. When Tom rescued Frankie the goldfish from his older brother’s evil science experiment by zapping him back to life with a battery, he never expected his pet to become a BIG FAT ZOMBIE GOLDFISH with incredible hypnotic powers . . . but he has to admit it’s helpful, especially when they are thwarting his big brother’s evil plans. Dodging booby traps, avoiding evil possibly-mummified kittens, discovering the truth behind the ancient Egyptian Curse at the local museum . . . it’s all in a night’s work for a zombie goldfish! Then, there’s something fishy going on at sports day. Can Frankie help Pradeep and Tom to foil Mark’s evil plans? Or will Mark and his pet vampire kitten, Fang, take home the gold? New York Times-bestselling author Mo O’Hara delivers more laugh-out-loud fun in this illustrated chapter book series. The name’s Goldfish. Zombie Goldfish. Fishy mayhem abounds with two more fin-tastic stories from author Mo O’Hara featuring our favorite (New York Times-bestselling!) zombie goldfish. In Live and Let Swim, a normal trip to the aquarium for Tom, Pradeep, and Sami suddenly turns into a death-defying race to save Frankie from being eaten by a hungry psychic octopus during their big brothers’ latest evil plan. Live and Let Swim by New York Times-bestselling author Mo O’Hara brings back all the kooky fun and humour you’ve come to expect from this irresistible chapter book series. Fish-tory comes to life with two more fin-tastic stories featuring our favorite zombie goldfish Frankie from New York Times-bestselling author Mo O’Hara. My FANGtastically Evil Vampire Pet, the epic spin-off of Mo O’Hara’s New York Times bestselling My Big Fat Zombie Goldfish series features an aspiring evil scientist, paranormal pets, and plenty of hilarious summer camp shenanigans. Currently only available in the US or through a US online supplier. 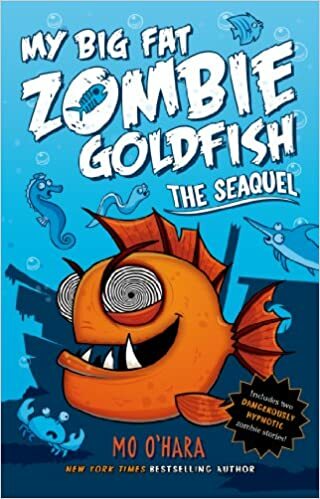 An interactive book, this book allows you to take centre stage in your own Zombie Goldfish adventure! “Mo O’Hara’s visit to St. Mary’s CEP School was inspirational. Her personality shone out during a whole school assembly and with a combination of props, costumes, audience participation and her hysterical account of how she was inspired to write her Big Fat Zombie Goldfish stories, she held the attention of both pupils and staff alike. This was followed up with engaging Key Stage 2 writing workshops where the children explored their ‘What ifs’ to create amazing new stories. The whole experience was energizing and left the pupils with a buzz that continued weeks after her visit. It was fascinating to hear how Mo had got into writing and what had inspired her to write the series. She brought along lots of props (Frankie and friends!) which made the whole session very interactive and hands on. The children in Books Aloud very much enjoyed the activities that Mo brought along for them to do, but also had lots of questions for Mo to answer which was lovely.